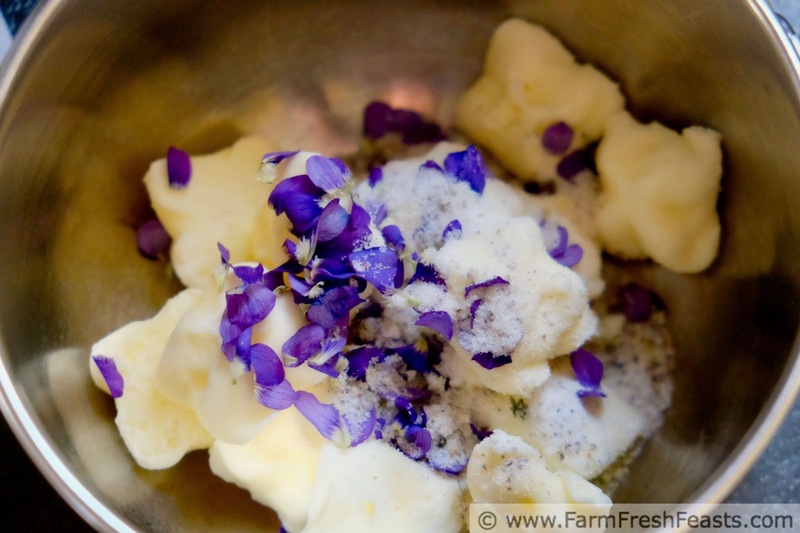 Fresh wild violets and wild violet sugar make a sweetly floral compound butter perfect for celebrating all things Spring. Add this spread to an Easter or Mother's Day brunch to bring a taste of fresh local foods to your table. Welcome to day 1 of #EasterWeek hosted by Bernadette from Rants From My Crazy Kitchen! The key ingredient in this recipe can be foraged, for free, across North America and beyond. I'm not one to turn away free food, especially free food that pops up when I'm most in need of a fresh local food fix after months of eating from the freezer, the canning shelves, and the Strategic Winter Squash Reserve. Granted, I cannot live on a diet of wild violets, but that doesn't stop me from using them in a variety of ways. Today's recipe is my third using wild violets. I've shared Wild Violet Granola, which I made using wild violet syrup. I've made Wild Violet Muffins--dunking the tops in wild violet sugar to finish them off sweetly. 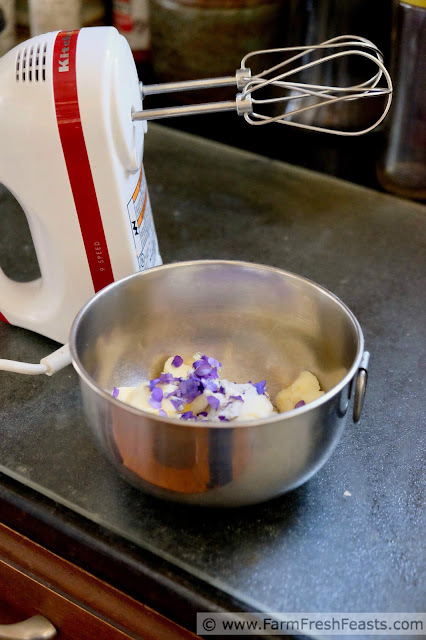 This time I'm also using the fresh flowers--not just in a syrup, jelly, or sugar preparation--to make a compound butter. Use this wild violet butter as a spread for biscuits, scones, muffins or toast. 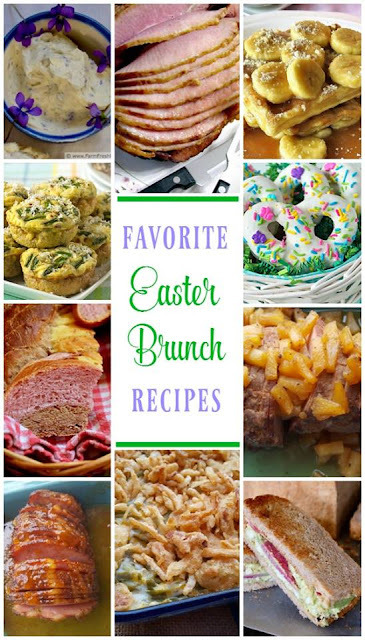 Add it to an Easter spread or Mother's Day brunch. If you're fortunate to have ample blossoms [I almost typed ample bosoms] it would be neat to decorate the table with some as well. Start with a good quality salted butter. Typically I buy unsalted butter in bulk, so making compound butters are when I splurge for the single packages of salted butter, and usually a European style butter because it's creamier. 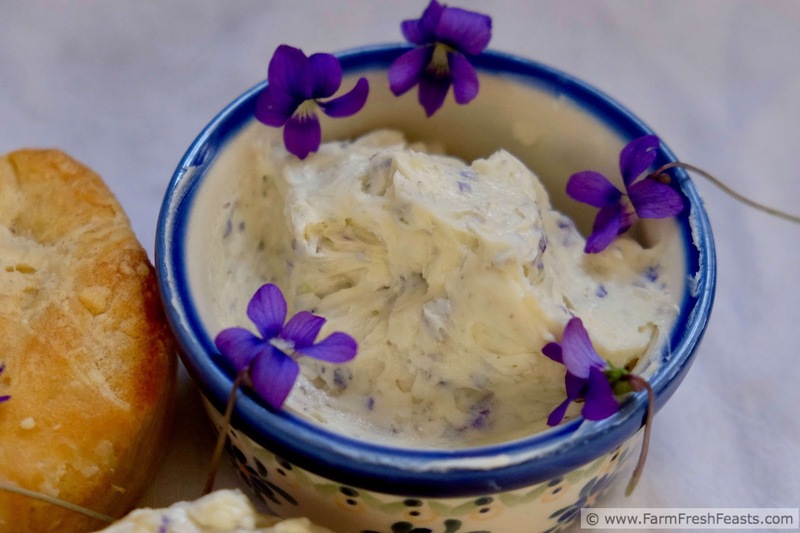 Making compound butters is an easy way to add a bit of flair to a holiday meal. They keep for several days in the fridge (longer in the freezer, although I've not frozen this type of butter) so you can prepare early for your celebration. 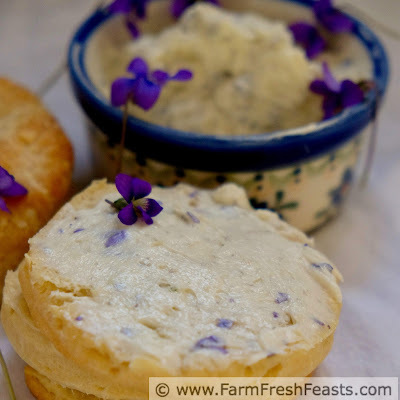 In the summertime I'll use an abundance of herbs to make Dill Butter. For Thanksgiving and Christmas I like to serve Cranberry Honey Butter. It's a small addition, but it's a nice touch that makes a special meal that much more special. As a gardener I don't spend too many brain bites on growing edible flowers. I enjoyed a high falutin' meal in Montana, complete with edible flowers scattered artfully across the plate, but I've only cultivated nasturtiums once. [They like poor soil. Unfortunately, I'm my father's daughter and I like to amend my soil.] Wild violets are another story. My spouse carefully nurtures any clumps of violets that happen to appear in our yard. The happy result is that each Spring we're rewarded with an ample supply of gorgeous purple flowers at a time when the dominant colors are switching from dead grass tan to leafy green. Do be smart about your foraging for wild violets. Rinse them well after harvest, and if the area you're getting your blossoms isn't your own, do ask the property owners for permission and inquire about the use of pesticides. There's a thick stand of wild violets in an alley nearby and I'm certain no pesticides are used. Heck, it's not mowed or maintained in any way. Still, common sense dictates that you check it out before you help yourself. Or cultivate your own violets! 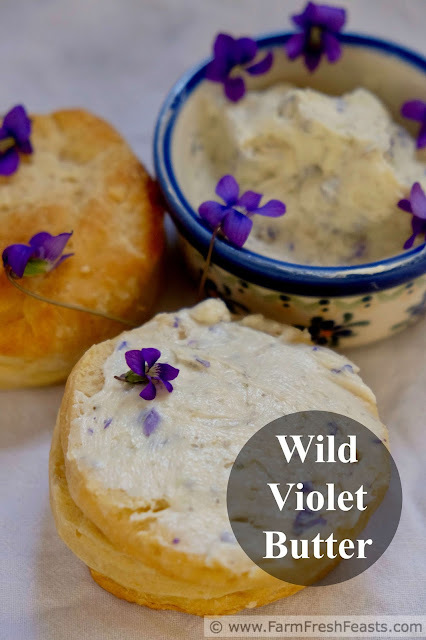 For more recipes using wild violets, please see my Wild Violet Recipes Collection. It's part of the Visual Recipe Index by Ingredient, a resource for folks like me eating from the farm share, the farmer's market, the garden, the neighbor's garden, and great deals on ugly produce at the grocery store. Put all ingredients into a bowl. Beat with a hand mixer until thoroughly combined. 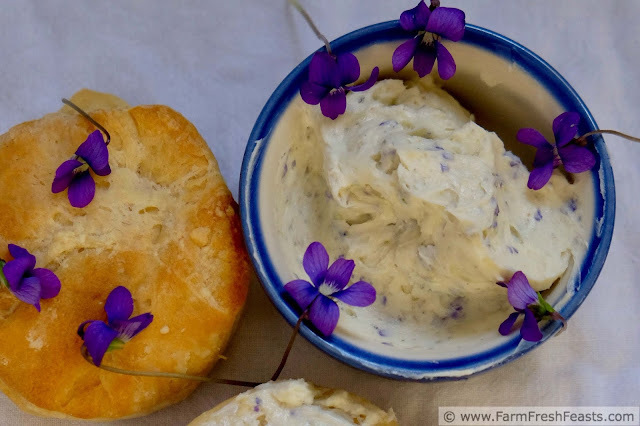 Wild Violet Butter from Farm Fresh Feasts that's me! I've never cooked or baked with fresh flowers, but this spread is too gorgeous to pass up! I have to try it! This butter is just gorgeous. What a beautifully springy addition to any Easter table. I think an ample bosom is a benefit...sometimes.